Healthy. Timber is natural, hard wearing and when maintained and kept clean it avoids carrying dust and allergens which promote asthma and other respiratory problems. Ecological. Timber Floors are ecologically friendly. Since it is a natural resource, timber is both renewable and recyclable. Timber Floors have an environmental impact which creates 5 times less carbon emissions than ceramic tiles (source: CRC for Greenhouse Accounting). Durable. 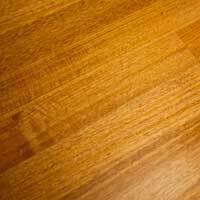 Timber floors are believed to be the most durable and low maintenance floor covering of nowadays. Variety. There are a lot of styles, colours and species of timber flooring available than ever before. You can find the colour and style of timber floor to fit your interior. Affordable. With the correct coating for your circumstances and regular cleaning your timber floor finish may last for up to 8 years before you need to consider recoating. The cost of recoating a timber floor is far more affordable than replacing carpet which begins to look worn, in many cases after 5 or so years. Easy to maintain. Maintenance of today's timber floors is easy. New technology in stains and finishes that takes little more than sweeping and with occasional use of a professional timber floor cleaning product. Flexible. Hardwood timber floors will always look good both in contemporary and traditional interior design. Timber flooring comes in a variety of styles to suit different decoration needs. There are two most common styles of timber flooring: strip flooring and parquetry. Solid Strip flooring – narrow, linear flooring that makes the room appear larger. Nowadays strip flooring is side and end matched, which means that both the long edges and the short ends of each piece are tongue and grooved. When fit tightly together and nailed firmly to subfloor, the tongues and grooves make a stiff assembly that improves the structural integrity of the building. Before choosing a style, take certain factors into consideration, such as the room usage, the amount of traffic in that area and the size of the room. Traditional 19mm tongue and groove solid strip flooring can be nailed to bearers, joists or to battens over concrete. Overly 10, 13 and 14mm solid strip flooring is installed over concrete, existing timber floors or plywood. Advantages: Solid strip flooring makes the room to appear larger as well as it handles foot traffic straight after the installation. Parquetry flooring probably is the most spectacular of all flooring types. 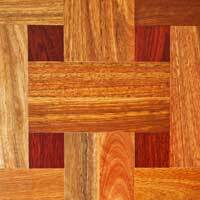 Basically parquet flooring is hardwood pieces put together in a geometric pattern. Parquetry comes in individual timber pieces that are put together and made into whatever ornament you want. Combining different species into the same floor and installing the pattern you like, we can make your floor look unique. It will give your floor that special look and character. Parquetry flooring has the same characteristics as strip flooring. It is hard wearing does not carry dust, easy to keep clean, etc. Comparing to strip flooring, parquetry flooring allows you to make any pattern you want and it can be laid over concrete or any other flat and dry surface. Advantages: Parquetry is hard wearing, decorative floor covering. It handles heavy traffic areas and that is why it is good for halls, steps, dance studios, entrances and passages. 4. Polyurethane: solvent borne and waterborne. We highly recommend our clients to use polyurethane coating (solvent borne or water borne). Comparing to other finishes, it is higher wear resistant and requires less regular maintenance. Natural /Feature Grade - exhibits a high level of natural features including knots, gum veins, burls, spirals etc. It displays all the natural appeal of the timber. That gives the floor a unique character. The wider the boards, the more natural features you can find. Wider boards make the natural features to show up more than narrower boards. Standard Grade – medium feature grade that provides average level of natural features of the timber. It shows more visible signs of gum veins, insect trails and burls than select grade. Select Grade – timber flooring that provides a low level of natural features. No gum veins, spirals, burls, insect trails can be found on select grade timber flooring. A timber floor is a lifelong investment. If you follow the correct cleaning techniques, it gives your floor the shine and fresh look that you want. You should use rugs both inside and outside doorways to help prevent grit, dirt and other debris from being tracked onto your timber floors. This will prevent scratching. We suggest putting felt pads or protectors on the feet of chairs and tables to prevent scuffing and scratching. Do not wet-mop a timber floor. Standing water can dull the finish, damage the timber and leave a discolouring residue. Antistatic mops are effective for collecting dust and grit. As an important component of your Timber floor maintenance, we recommend to do light sand and finish every couple years when you feel the coating has been worn down. This would save your money and make your floor look like new. Once you have decided to install or refinish your Timber floor, you may wonder what to do next. Knowing what to expect before, during and after the work takes place will help ensure a high-quality job. Ensure the site conditions are suitable. Timber floor can only be installed in waterproof building. All furnishing, paintings and other items should be removed from the room. For newly installed floor, the timber will need to acclimate, which will vary from two days to two weeks or even longer. During. If building or renovating, the start date for sanding and coating floors depends on other trades. Carpentry, electrical, plastering, plumbing, and glazing must be completed before work on the floor starts. Do not expect a completely dust free environment. Our sanding machinery is fitted with dust collecting equipment and our floor sanders will endeavour to clean the dust away by vacuuming the surfaces. When the finish is applied, stay off your floors until it has dried. The time required depends on the type of finish used. After the coating has dried, put felt pads on the bottoms of any furniture to minimize scratches and dents. Keep in mind that not all floorboards will be identical. Variations in appearance are completely normal. As your floor ages, some colour changes can occur. Seasonal humidity change may cause the wood to expand and contract. Cracks are normal and will appear and disappear between floor boards during seasons of high and low humidity. With more than 15 years experience, Woodpecker Floor provides you excellent timber floor services including timber floors installation, sanding & finishing as well as timber floors repairing. Welcome to come and see the quality of our floorboards at our Alphington Showroom.